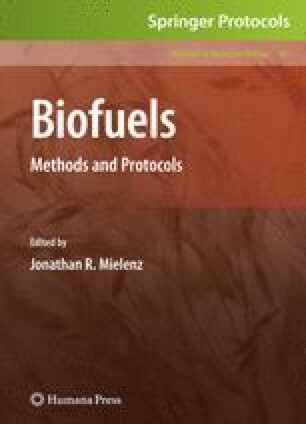 Cellulase enzyme is a key cost component in the production of fuels and chemicals from lignocellulosic biomass. Cellulolytic ability of the enzyme preparation is often measured by activity assays using model substrates such as filter paper. Using lignocellulosic biomass as the substrate to assess enzyme performance has the potential of being more process relevant. We describe two procedures that use washed pretreated cellulosic material to measure the efficacy of cellulase enzymes. First, a saccharification assay that measures glucose yield as a function of the amount of cellulase used in the process. And second, the simultaneous saccharification and fermentation (SSF) assay measures cellulase performance by the amount of ethanol produced from enzymatic hydrolysis of the cellulosic material. You can use both assays to screen cellulases under a variety of substrate types, loadings, and process conditions. This work was supported by the Office of Biomass Program in the Department of Energy’s Office of Energy Efficiency and Renewable Energy. I would also like to thank my NREL colleagues Daniel Schell, Ali Mohagheghi, Mildred Zuccarello, and Gary McMillen for reviewing this chapter.